So I’m at it again… I broke out the oil paints. Every once in a while I get the urge. Sometimes it’s just that I want a break from gouache (as much as I love it), and sometimes it’s as simple as “hey I’ve had this cool-shaped canvas sitting here for months! I shall do something with it!” Since gouache doesn’t stick to canvas, I have few options. Oils have this delightful quality to them that’s hard to explain. It’s something about the glowy transparency of the oil that makes me feel all warm and fuzzy inside. The ability to layer and create large, smooth areas is a great perk, which I take advantage of every time, since gouache can’t do that. And they smell good, too. BUT. I don’t break them out too often. The main reasons: They’re such a mess. They try my patience. And they take up a too much real estate. The mess: oil, thinner, and sticky paint that doesn’t dry fast enough and all the sudden you put a thumbprint in your masterpiece trying to pick a cat hair out of it even though you painted it 3 days ago. Patience: see above about drying time. When I want to paint, I want to paint NOW DAMNIT. And space: again with the drying time and needing someplace to set it for 3 days that I could be using for my smaller gouache commissions. And everything’s bigger. Oil on left. Gouache on right. canvas or masonite or etc. But despite all that they’re out and I’m enjoying it. Maybe it’s the Spring in the air, or maybe I’m just due for a little crazy. I have a thing for the three primary colors together, so I did one of each, using several tube colors for each. I tried to make the brushstrokes fit the emotion associated with the color. Then I let them dry. For a month. It took forever. Then I went to Larry’s class and learned how to make the paint flow better and dry faster (with thinner, medium, and dryer). So I went back and painted the faces last week, and they dried in a day or two. Woo! Here she is… as finished as I can manage. Another nice thing about oils is that I can fix anything later on, so critiques are welcome! I think the contrast on her skin isn’t high enough, but I’m afraid I’ll ruin it if I do anything. I already tried darkening it and nearly botched the whole thing. Maybe I’ll go back after I’ve done a few weeks of nice, predictable pencil work. It’s too big to fit on my scanner, so I photographed it with my snarky digital camera. The color’s pretty good but the contrast and detail aren’t quite right. I have just a few more steps to get that painting from class finished. I really hate how long oil paint takes to dry. It’s nice for fixing problems or taking a break to eat dinner, but it also means I have to wait 2 or 3 days for an area to dry before I can continue working. In the meantime, I’ll share with you some random things I learned about oil painting. Feel free to add your own hints and tips. The more paint you squirt onto your palette (or mix up), the longer you can use it. It’ll usually form a skin overnight, but the paint underneath is still pretty good the next day. If your use of the palette knife is vigorous, keep a few backups on hand. They aren’t too sturdy. Master’s Brush Cleaner rocks. It works great for gouache, too… but make sure you have one for each. I had never used anything to thin oil paint except thinner (turpenoid). Adding an oil medium to the paint helps it flow a lot better, but also lengthens the drying time. In class I learned that 1/3 thinner, 2/3 oil, and a few drops of cobalt dryer work well – it makes the paint flow well and dry reasonably quickly. Just don’t lick your brushes, or use it around small children – cobalt dryer is poisonous. Masonite is easier to paint on than canvas, but you have to gesso it. Prepared Claybord is too smooth and Gessobord is pretty rough – although I have yet to try Gessobord with oils. The oil painting on Claybord in that post finally sold this week after hanging in the Marietta Pizza Company for six months! 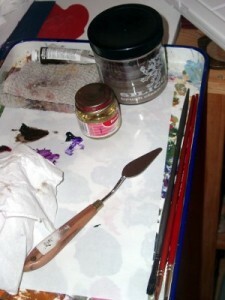 I hope to have the workshop painting finished and blogged by mid-week. Hey everyone! I’ve been quiet for the last week and a half because I’ve been at an art workshop. I went to Kentucky to learn oil painting techniques from the top-notch fantasy artist Larry Elmore. I met some fabulous people (Daniel, Rhea, Laura, and Erik) and reunited with good friends (Kelly and Ken) and had a blast. I’ll post this painting again when I get it finished up! I don’t know about normal people, but I experience a lot of inspiration during that magical world between awake and asleep. Whether waking up or falling asleep, I often see vivid images behind my eyelids, usually taking shape from whatever I’d been thinking about that day. Sometimes the images are purely random, though, and from one of those incidents came inspiration to paint an abstract. I’d never been one to do abstracts. I found them interesting to look at, but not necessarily challenging to paint. After all, it doesn’t actually have to look like anything. That’s true, but after having painted two of them, and after studying some of Casey Klahn‘s work and his posts on colorist theory, I may have changed my mind. Casey does very interesting work in pastels using pure color, and he has some recent posts about Jackson Pollock, an artist whose work I’ve always liked. The first one was random, starting with my half-asleep brain and going from there, just doing what felt right with the brush. When I was done, I noticed that it reminded me a bit of a population graph. I named it accordingly, and set off to do another that looked more like a graph. That’s it. I enjoyed using color straight from the tube and letting my intuition play with the compositions. The best part about this experiment, and the reason I’ll do more of these, is the response from viewers. No two people see the same thing when they look at these paintings. Usually people look at my work and say, “nice octopus.” This time, I got impressions ranging from “pretty close” to “I would never have thought of that.” People say these remind them of a beach, warring factions, flags, elections, political parties, and tectonic plates. How cool is that? I am fascinated by the things people see in these paintings, and it really makes me want to do more. Thanks to The Sister for the title. Despite the fact that it took me a week of evenings to finish because of the slow-drying oil paint, I enjoyed working on this guy. But it brings up an interesting question: what to do about the staples? Do you paint over them? Frame the piece? Or are you smart enough to buy only gallery-wrap canvas? All opinions requested. I have 7 more of these stapled 6×6″ canvases to paint. A similar question: if you paint on cradled board, do you paint the sides, or leave the wood as-is? Anyway, I’ve recently been doing some small oils and gouaches, going back and forth. This has helped me appreciate the oils a little more. Gouache still wins hands-down in a head-to-head matchup – it took me a week to do a 6×6″ oil because I had to keep waiting for it to dry (whine! want to paint NOW!) – but there is one thing about it that can’t compare to oil: blending brushstrokes. They say gouache is great for coloring illustrations because of the smooth, flawless areas of color it can create. I have never been able to achieve such smoothness – I end up with brushstrokes showing everywhere. I’m convinced that it requires 1) very smooth supports and 2) perfect paint consistency. I possess #1, but #2 requires more skill than I currently have. Plus, the stuff dries so fast that the perfect-consistency-paint you mixed an hour ago is now tacky or totally dry. Excuses, excuses, I know… but either way, I haven’t been able to get that smooth finish that gouache is known for. With oils, I can get it every time, effortlessly. Meh. 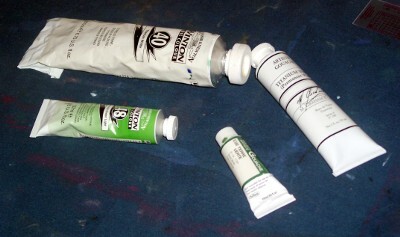 Here is an example of how to make oil or gouache work with Claybord Smooth. Go here to see an example of how to make a horrible streaky mess with oil on Claybord Smooth. I painted the background weeks ago, and it is all streaky and ugly and brushstrokey. However, it dried to a nice textured finish, so painting over the top of it was sort of like painting on canvas. It works really well for oil, and pretty well for gouache.